It's classic tic-tac toe game it new visual style. You have to be build line from three own symbols ("X" or "O") horizontal, vertical or diagonal. Remember,"X" always goes first. Try to beat a rival! The first hospital's service was a big success, and has built bigger than previous. Help the nurse to take care of the patients. Reach the daily goals and unlock fancy upgrades for the hospital. 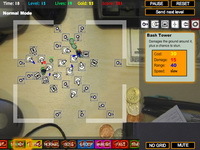 SAS Zombie Assault returns as a Tower Defense game! Your mission is to stop hordes of zombies in their tracks by deploying your SAS men and automated turrets in strategic locations throughout each area. Play 6 maps in Normal, Elite, Nightmare or Apocalypse modes. Pass each map to earn achievements and Awesome points, and also earn valuable SAS dollars to unlock powerful upgrades, buy helicopters, airstrikes and even nukes to help you out. Play SAS Zombie Assault TD now!